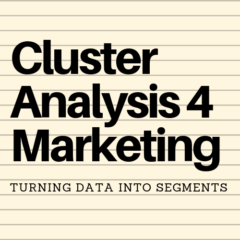 Please note that the information and the Excel template for running cluster analysis on this website have been provided free and in good faith. Testing has indicated that the template appears to work as required. Of course, as highlighted in the discussion of cluster analysis and varying results, this statistical technique will vary somewhat according to start (seed) points. This website is primarily designed for use by university students in their studies. It only allows for up to 100 respondents and is, therefore, not capable of analyzing a large customer database – it is primarily a learning tool. If you intend to use the free Excel template and/or the information on this website for business purposes, it is strongly recommended that you also seek the advice of a qualified marketing research consultant or data analyst with expertise in cluster analysis and developing market segments to help guide you. Please contact me if you have any questions regarding this disclaimer, or if you require a larger version of this template.